PHOTO BY MARYANN KROMER Ride operator Alex Chubokas of Cleveland is framed by the exit of Steel Vengeance Wednesday at Cedar Point. SANDUSKY — What kind of roller coaster features a maze of wooden beams, a hill 205 feet high and a 74-mph ride on 5,740 feet of steel track? That would be Steel Vengeance, a thrill ride resurrected from the carcass of Cedar Point’s Mean Streak. Tony Clark, director of communications at Cedar Point, did not want to mention the ride’s old name because it is deceased, having been given its final honors in 2017. It is remembered with a tombstone in the “dead ride cemetery” on the midway. The change came about from patron surveys. “When we ask guests what rides they like, what they don’t like, (we found) it was not as well-received as Millennium Force or Top Thrill Dragster,” Clark said. They decided to use the old structure to create something that had not been done before. That was about three years ago, when Rocky Mountain Construction was building its reputation for refurbishing older coasters with new technology. The company removed some parts and added others, including four inversions, Clark said. He said the coaster’s operators receive a day of training with the park’s operations team. More instruction comes from IROC, a company that sets standards for theme park ride operations nationwide. Onsite training is provided for every ride. Employees test each ride every morning before the park opens, listening for abnormal sounds and performing visual checks of the structures and systems. Once riders arrive, operators must check height requirements and keep an eye open for any potential hazards, such as jewelry, phones or cameras that could fly out during the ride. The Steel Vengeance crew learns every job, and workers rotate and take breaks at specific intervals. After closing, more checks are done, along with cleaning of belts, lap bars and other surfaces. 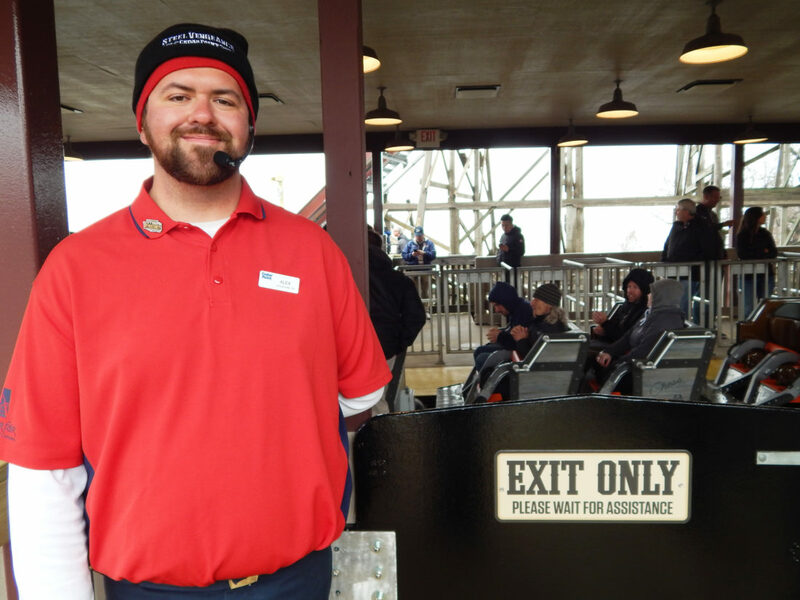 Alex Chubokas of Cleveland is working his fourth season at Cedar Point and said it is a “dream opportunity” to be part of the Steel Vengeance crew. Chubokas said he reported to the park at 3 a.m. for media day festivities. During the season, it will be around 7 a.m. to make the important test ride. “Welcome back. How was your ride?” is his greeting for returning riders. A script includes all the vital safety information he must announce before and after the ride, but he also can improvise to get riders “pumped up,” Chubokas said. Other rides he has worked on include Millennium Force, Magnum, Valraven and Corkscrew, but this is his favorite, despite his responsibilities. “It’s hard not to have fun,” he said.